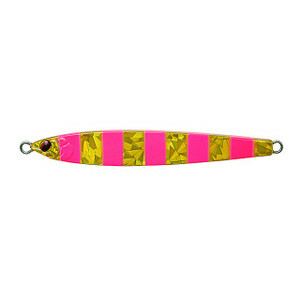 This is the ultimate standard type main target， but it is also effective for blue and sea bass. Ocean Dominator Classic is a standard plate-shaped metal jig as its name. Until now Ocean Dominator has developed jigs that can catch" in search of other swimming and falls. Among them， this standard type was a shape that I dared to avoid. However， the more I studied light jigging， the more I felt the need for a so-called "plate-shaped" metal jig， and this shape saw the most effective pattern many times. Therefore we began to develop this classic. However， it is not just a metal jig because it is released as an Ocean Dominator brand. The thickness of the front and rear， the position of the center of gravity， these were tested many times and completed with the balance considered as the best. The main target is Tatouu but it is also effective for blue and sea bass. * The image of the product you are posting is displaying the representative image. Moreover， the color may look different from the real one. Please be forewarned."